If you have a sclerotic hospital system on which everyone else has given up, the solution is Dr. Ramanathan Raju, currently the head of the public hospital system in New York but previously chief executive of the Cook County Health and Hospitals System.Â No one in Chicago public life gets an A-plus from everyone, but doctors, politicians and journalists alike agree that Dr. Raju took a failing system and turned it around: re-imagining its role in a changed health care landscape while dealing with its day-to-day personnel and quality issues. The improvement has been dramatic and rapid: though Dr. Raju was only in place for two years (much to our dismay), the improvement in the Cook County public health system is obvious to all. Hire Dr. Raju to fix the V.A.Â He’s never met a bureaucracy he couldn’t tame. The huge variance between states in the takeup of private insurance policies under ACA. As you all know, December was an excellent month for the ACA exchanges, federal and state. The official HHS totals at 28 December were 2.15 million for market policies, 1.58 million for Medicaid/SCHIP. Charles Gaba’s running total for all new ACA coverage â€“ including the mass Medicaid baptisms by transfers from state schemes, private policies contracted outside the exchanges, and under-26es added to their parents’ policies â€“ stands at a round 10 million today. The HHS report rightly ignores the puerile talking point that the private policies aren’t all paid up. So what? Why should anybody shop with great difficulty for medical insurance, choose a policy, and abandon it at the till at the last minute like an excess packet of cornflakes? It does go in detail into the demographics, as a high takeup by healthier young people will be crucial to the actuarial viability of the plan. I’ve nothing to add on this issue to the full commentary of others. Matt Yglesias’ worries were answered, to my mind conclusively, by Kevin Drum, Sarah Kliff and Josh Marshall. Short take: the ranking expert at Kaiser says the takeup by under-35s is currently at the minimum for viability, with modest premium increases, and on past experience and by common sense the proportion will rise. Above all, the insurance industry is silent. If there were a real risk of a death spiral, they’d be screaming blue murder. One good big prediction, two poor lesser ones. On November 28 I welcomed the first million enrolees under ACA, whether to marketplace policies or Medicaid/SCHIP. The post was based on the fragmentary data available at the time, brought together in Charles “brainwrap” Gaba’s invaluable running spreadsheet, with some extra tweaks and guesswork by me. My headline number: one million. 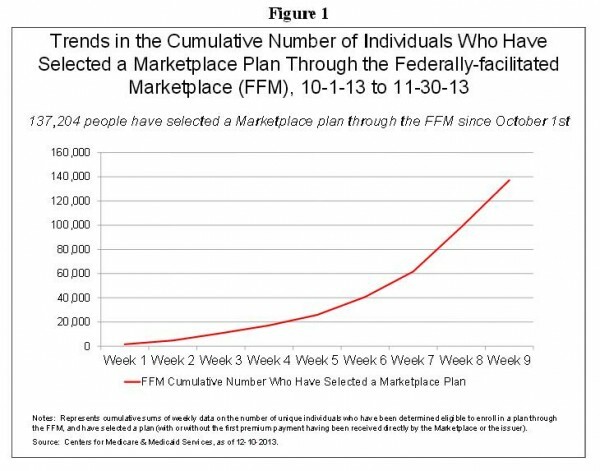 HHS:Â “Number of Persons who have Selected a Marketplace Plan or had a Medicaid/CHIP Determination or Assessment: 1.2 million”. “And then, one day, health care for all came up. Arthur Applbaum sends the following. A Little President planted a health care seed. around the seed and sprinkled the ground with facts. But no one signed up. And no one signed up. and sprinkled the ground with facts. 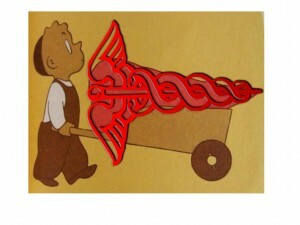 health care for all came up. Just as the Little President had known it would. The Little Healthcare.gov That Could. The numbers show that healthgov.com is working. The HHS has released its first detailed statistical report on ACA online applications processed in the first month (October 1 – November 2). The split of the 846,184 completed applications between states running their own marketplaces and those relying on healthgov.com is 326,623 (39%) toÂ 519,561 (61%). Some of the other eligibility indicators have similar ratios. 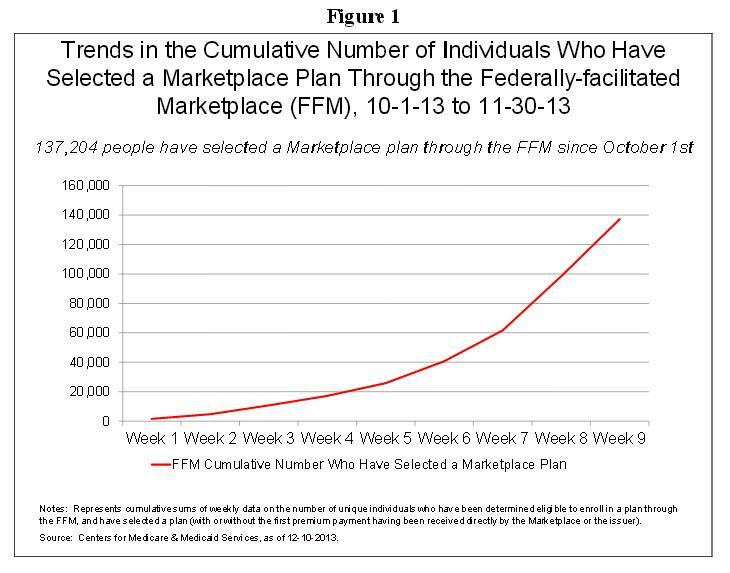 However, of the 106,185 individuals who have selected a marketplace plan, it’s 79,391 (75%) to 26,794 (25%). This no doubt reflects the much worse start of the federal site. The tables exclude all those who have tried to make an application and failed to complete it because of software or administrative snafus. If you read the despairing comments on the hhs blogÂ – a sounding board for the lost without any responses – some unfortunate citizens have been trying since October 1. The best advice seems to be to abandon a jammed application and try again: with paranoid care, a new email address and a virgin browser. On the other side, the report does not include the first fortnight in November, when by all accounts the federal website was working much better than in October. Healthgov.com is still far from Amazon’s smoothness, as Zients’ team readily admits. The claim that it’s an irremediably broken system is b/s. Healthgov has determined 886,015 Americans as eligible for a marketplace insurance plan or Medicaid. A broken system, as opposed to an unacceptably buggy, unfriendly, maddening one, could not possibly have done this. It still of course has a long way to go. The 106,185 who have selected an insurance plan represent 1.5% of the estimated total of the eligible – a slightly better rate, as the report cattily notes, to the early take up of Romneycare in Massachusetts in 2007. Please look at the HHS report before commenting. A different thought. One of the surprises in the website enrollment is the large proportion found eligible for Medicaid or CHIP: 396,261. ACA did expand eligibility for Medicaid (outside the neo-Confederacy), so many of these were not eligible before. But I wonder: how many may have been, but did not apply out of ignorance or fear of stigma? The great thing with universal health care (which ACA isn’t quite, but near) is that it’s a right, so there’s no shame in claiming it. 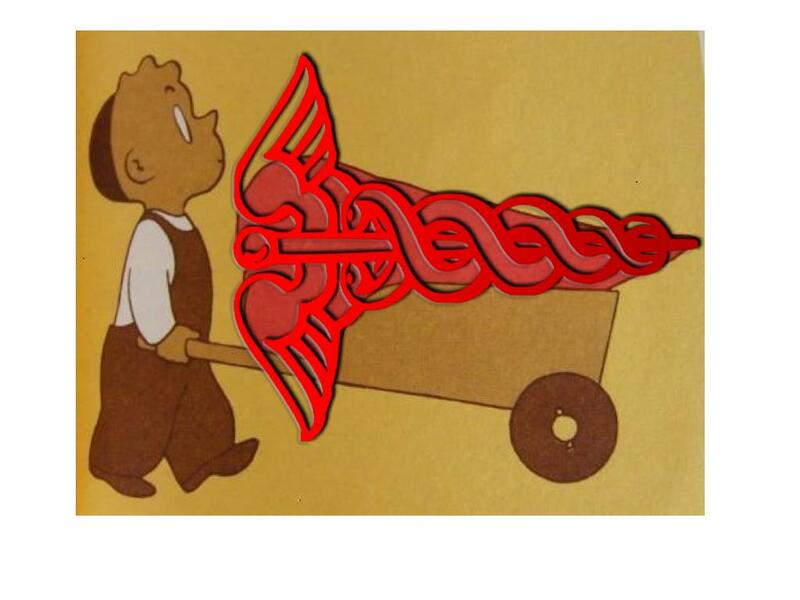 Author James WimberleyPosted on November 17, 2013 November 18, 2013 Categories Health & MedicineTags Health Care, Management27 Comments on Healthgov.snfu? No. That is the big question being considered in this long read about the direct-to-consumer genetics firm 23andme and one mother’s struggle to make sense of (and peace with) a $99 genetic profile she got of her 5 year old adopted daughter. I was interviewed for this story because of my work on the use of genetic markers as potential risk adjustor/underwriting variables for private long term care insurance and the fact that the author’s daughter was found to have the e4/e4 variant of APOE-4 which confers increased risk of Alzheimer’s disease. It is not that AD is not a terrible disease, and goodness knows our nation’s long term care system is messed up, but you can only worry about so many things at once. There must be good uses of such genetic profiles, but it seems easier to get it wrong than right. And coming up with a coherent long term system is not important because a given person is at increased risk of AD, but because we know for certain that many of use now alive will contract the disease, it is just not clear who. Author Don TaylorPosted on October 25, 2013 Categories Health & MedicineTags Health Care, Long Term Care7 Comments on Do you want to know the future? “Trickle-down” is not the only way to finance health-care innovation. Millian. You fairly explicated your interlocutors’ best arguments before astutely rebutting them. A model essay. Agreed as to the format: when Douthat is finished, you know what he wants, why he wants it, and what the stakes are. Â In particular, he is frank in saying that his preferred alternative would continue to create great financial stress for the non-rich when they get sick. 1. It’s easy to waste money on health care that could be better spent on something else. To #1, I would reply that lots of consumer spending is “wasted;” see Robert Frank’s Luxury Fever.Â Â Both the intra-personal hedonic treadmill and the interpersonal process of Veblenian competitive expenditure greatly reduce the marginal welfare gain of a dollar moved from health-care spending to something else consumers (have been persuaded by marketers that they) want. I don’t think we have any reason to think that the marginal healthcare dollar buys less happiness than the marginal dollar spent on anything else; the opposite might easily be the case. Is there any reason to think that patents are really the right way to finance the development of new pharmaceuticals, imaging devices, and medical equipment? Seems radically implausible to me, given prizes and publicly financed development of innovations which are then put into the public domain as alternatives. Even if the rest of Douthat’s argument were more convincing than I find it, his casual acceptance of widespread financial stress as an acceptable side-effect of an approach whose benefits Â – as he admits – are mostly speculative, strikes me as somewhat hard-hearted. Â Increasing inequality has made financial stress much more common than it used to be, even in the face of rising GDP per capita. Financial stress is bad for health, and even for effective IQ. It seems to me that the presumption against financial-stress-increasing policy choices ought to be fairly overwhelming. All of that said, Yeselson (and Chris Hayes) are right. It’s good to have a conservative writer whom it’s possible to engage in serious policy debate.